Borussia wasted the big chance to take a major step towards a qualification for European football with a well-deserved 1:3 loss at the Dutch border. The small Borussia from the lower Rhine proved to be too big once more for Westfalen’s pride. The match was already over before the Borussians had started to play. Surely it must be a Bundesliga record to concede a goal in the opening minute of the match for the 3rd time in a season, but of course that is no pole position to be proud of. With Hoffenheim’s loss at Cologne a win at Gladbach would have put the black’n’yellows only one point behind the magical 7th position which should guarantee a Europa League qualifying spot at the end of the season. But once again the team proved to be too weak to grab the chance it was given. We remain nailed to the 10th position in the table and even relegation is not yet out of the question, as we only have a 6 point advantage over Paderborn on 16. This season continues to be hard to swallow. Marco Reus was still unable to play and with Erik Durm and Sven Bender the already well-filled Borussia sick bay saw two more arrivals. So Jürgen Klopp was forced to play around with his line-up once more. He opted for Sokratis on the right wing and left Kevin Großkreutz sidelined who got to play with the reserve against Unterhaching on Sunday instead. But the skipper was back on board: Mats Hummels returned to the pitch. In the aftermath it would have been better to give the defender some more rest. Hummels was clearly out of shape and his sloppy defending lead to two decisive goals. We have seen too many players returning too early after injuries this season, but this time there was just no need to field Hummels. Sokratis is great as centre-back but mostly awful on the right wing and Großkreutz has been training with the team long enough to be an alternative. It seems that Jürgen Klopp has lost his touch as well, will he find it in time to get the team on track to international football? It would be a vital point in the ongoing contract negotiations with Hummels and Gündogan and would make it easier to sign fresh talent in summer. But at the moment is just does not look like the turnaround will come anytime soon. BVB with the worst start once more! Not one minute was played when the BVB defence handed out an invitation to the 11 from the lower Rhine. Hummels seemed to be still asleep when he slipped in the box and cleared the way for the Gladbach attack. Kruse’s first try was denied by Weidenfeller’s foot but there was absolutely nothing he could do against Wendt’s goal-hanger. 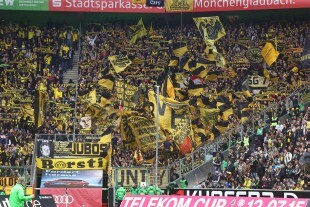 The low expectations of the BVB supporters became reality even faster than anyone had imagined. The BVB defenders were mere bystanders who did not want to get involved into the game at such an early stage. Another example of the concentration problems the team has shown all season. The early lead played well into the cards of the hosts. Now they could step back and follow the counter approach their coach Lucien Favre prefers. But in the first 15 minutes there were no counter attacks. BVB took control of the ball but could not create any real scoring opportunities. That fits the story of this season so well. Defensive blunders and a harmless offence have been our faithful companions so far. Once more the BVB game did not look too bad until they managed to get the ball close to or into the box. Then it was always close…but no cigar. 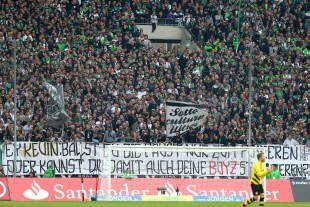 After 20 minutes it seemed as if VfL Gladbach had decoded the BVB approach. So the ball remained mostly in the BVB ranks but the black’n’yellows did not find the key to get into the dangerous spaces in or around the box anymore. After half an hour the inevitable happened. Skipper Hummels got impatient once more and tried to conquer the ball far in the opposite half. He failed and so Subotic stood alone against the sprinters Hermann and Raffael. Hermann kept his cool and provided a perfect assist to his Brazilian team-mate who kicked the ball into the empty net effortlessly. The BVB offence kept on pushing but they did so devoid of any ideas and so the VfL defenders had no problems to keep the danger well away from their goal. Where has the esprit of players like Kagawa or Mkhitaryan disappeared to? Nobody knows. Whenever the hosts cared to try and attack they were more dangerous than the overpriced Borussia attack. And so Gladbach took a well-deserved lead into the halftime break, even though they did not do anything more than the necessary minimum. 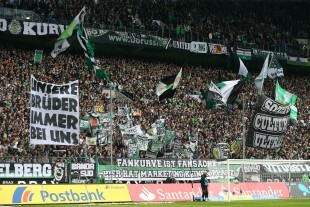 The Gladbach supporters had their first big moment of the day when they greeted Kevin Großkreutz with a banner when he started to warm up right before them, because he is friends with the controversial Köln supporters-group Boyz Cologne. I won’t translate their homophobic statement though, because it only shows how narrow-minded these borderland farmerboys really are. BVB started okay into the 2nd half. Even though Jürgen Klopp did not make any changes to his line-up, his team suddenly seemed a lot more dangerous. But Klopp had made some tactical adjustments. Schmelzer moved forward into midfield and Borussia played with only three men in the back line. But first Kagawa missed a sitter and then Kuba did not find a team-mate with his cross. It was Kagawa again who missed the decisive centimeters to score. But then the Gladbach 4-4-2 found their good positioning again and the door for BVB was closed again. On came Adrian Ramos but he could not prove to be an alternative. As well as his comrades he fought, but was harmless in front of the goal. And so Nordtveit delivered the killing blow. He was left completely unmarked at the far post after a corner and when the ball fell in front of his feet he pushed it into the empty net with ease. Twenty minutes before the end, Jürgen Klopp gave one of our youngsters the opportunity to gain some experience. Jeremy “JD40” Dudziak, the new selfie-king of the squad, replaced Marcel Schmelzer. But even though it was no game for him to shine he made the most of it. The black’n’yellows had surrendered to the superior home team by now. Not even presents were accepted. Sebastian Kehl could not take advantage of the situation when a VfL defender slipped in the box. But Dudziak grabbed the opportunity he was given and produced a proper service for Ilkay Gündogan. Gündogan converted it to score the honorary 1:3. With 15 minutes to go there even was a slim chance for a comeback, but the Borussians did not give the impression of a team that has regained his hope. Ciro Immobile who is obviously not a real alternative for Klopp anymore got some minutes to play as well. Maybe the idea was to make him impress some potential buyers for the summer transfer window. But the Italian continues to be nothing but a big misunderstanding. He has no clue where to run to create chances and the rest of the team does not find a way to provide him with the passes he needs. His best moments were a desperate shot from 35 meters and another try from a sharp angle that went well over the bar. And so the season continues as sickening as it was before. Whenever a window seems to open to make a step towards the European starting positions the team slams it shut with a terribly harmless match. The next two home games will decide if we can hold on to our European hopes or have to deal with relegation worries for the rest of the season.